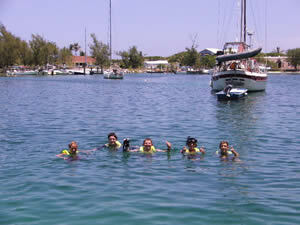 The quaint, peaceful and protected bay of Little Harbour lies at the southern most limits of the Sea of Abaco. It has a rich history, steeped in arts and crafts and is world famous for its foundry where the ancient art of lost-wax casting is kept alive. Randolph Johnston moved here from Canada via Massachusetts in the 1950's. He and his family lived aboard their schooner, the Langosta, while they were getting started. He became famous for his bronzes created through the lost-wax process. This process uses wax patterns and rubber molds, made from his originals. A metallurgist as well as an artist, his work demonstrates extremely fine detail. With a day's notice, your Captain can arrange a guided tour of the foundry so you can discover how an inert mass of clay is transmuted into a lively bronze sculpture - through a process which seems magical to the uninitiated. If you are lucky, it will be "casting day" and you can watch them pour bronze at 2200oF. When you have completed your tour you can visit the gallery, where the whole family has articles on display just south of the main dock. Little Harbour is also famous for Pete's Pub. The Pub is actually fashioned out of the pilot house and deck house of the sailing ship Langosta. This Robinson Crusoe style establishment is a favorite destination for thousands of tourists every year. A beautiful beach encircles half of the bay with a rocky headland on the opposite side. There are also enormous Pirate caves, which used to be home to the early settlers, just waiting for you to explore them! There is a great beach to visit on the ocean side to the north of the settlement and there is some good snorkeling to be found off the north west tip on this beach, which can be reached by boat or a short swim. A walk up the hill to the old lighthouse will be a rewarding experience! Take your cameras! The view from this promontory is as spectacular as you will find anywhere in Abaco. The view of the ocean is breathtaking and there is a "boiling hole", which provides an exceptional opportunity for photography if the tide and seas are just right!